Welcome to part two of three blogger interview with G. Neri. on his latest release Yummy. Feeling a little lost, check out part one at Crazy Quilts. My review of Yummy. 4. I am going to quickly piggy back on Edi's second question. Neri - Yummy is just your third novel. You've written a free verse novel, a YA novel, and now a graphic novel. Your debut Chess Rumble (which I loved) was very well received, getting many honors including 2008 ALA Notable Book and 2009 ALA quick pick for reluctant readers. 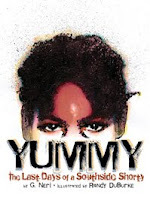 Did you ever consider writing Yummy as a free verse novel? miracle, they seem to fit together like a jigsaw puzzle, and I copied one slowly into the other, leaving me with a long, thin column of words. When I saw how the sentences where being broken up, I noticed it gave it more power and rhythm, and more of a distinct voice. I’d never written free verse, but loved Alice Walker poems, so I ran with it. And I guess, it worked. Now some folks would call me a poet because of that and the Lee Bennett Hopkins Poetry Award I won. But I wouldn’t dare call myself a poet. I’m just a storyteller. 5. Who was Yummy? Why tell this story? Yummy Sandifer was an 11 year old wannabee gangster who made the cover of TIME magazine in the 90s because of 5 days that captured the nation’s attention. Trying to impress his gang, he tried shooting at a rival gangbanger but accidentally killed a neighbor girl he knew growing up. He became a fugitive hiding in the Southside of Chicago as the story grew bigger by the day. But he became such a liability that his own gang took him out before he could squeal to the cops. What grabbed me and most people who read or saw these tragic events unfold, was how polarized the opinions were between the media, politicians, adults and kids. Some thought he was a straight up thug who got what he deserved. Others thought he was as much a victim as the girl. Others thought he’d been abused by his parents, the state system, his gang and the laws they took advantage of by using these little shorties. It was a great opportunity to talk about the gang issue in a bigger context and from all perspectives, without me moralizing about it. 6. Neri, you've written a powerful story. Reading Yummy I couldn't help but think about how this story plays out across the U.S. every day. Maybe not to this extreme but many boys are lost to the streets. Yummy has the ability to open eyes and minds. Is there anything you'd like to say to librarians or teachers who may think the gangs and violence within the story are too mature for their students? It really depends on the area and who the readers are. I know urban schools that could handle this story in 4th or 5th grade and most definitely by middle school. Some white suburban schools might respond to it in 8th, 9th or 10th grade. But to me, it is vital to begin this discussion at an age where young kids are getting sucked into gangs and these days, that could be anywhere from ages 8-14. Me or any teacher telling young people to stay out of gangs has no effect. Showing Yummy’s story is a powerful tonic that may plant a seed in a young person’s mind. Part three and conclusion of this three blogger interview with G. Neri is at Ari's Reading in Color blog.